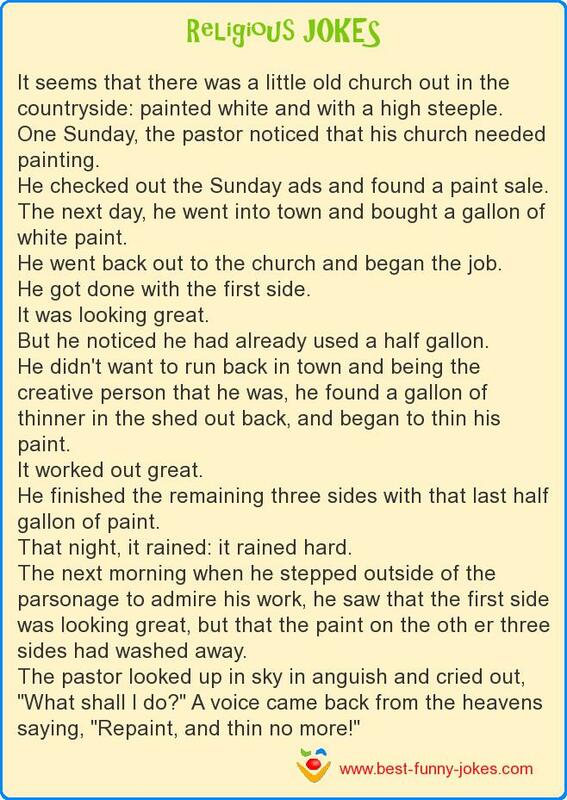 One Sunday, the pastor noticed that his church needed painting. He checked out the Sunday ads and found a paint sale. The next day, he went into town and bought a gallon of white paint. He went back out to the church and began the job. He got done with the first side. But he noticed he had already used a half gallon. He didn't want to run back in town and being the creative person that he was, he found a gallon of thinner in the shed out back, and began to thin his paint. He finished the remaining three sides with that last half gallon of paint. That night, it rained: it rained hard. The next morning when he stepped outside of the parsonage to admire his work, he saw that the first side was looking great, but that the paint on the oth er three sides had washed away. The pastor looked up in sky in anguish and cried out, "What shall I do?" A voice came back from the heavens saying, "Repaint, and thin no more!"